1/4 CT. T.W. Diamond Frame Stud Earrings in 14K White Gold A brilliant look for a beautiful woman, these diamond stud earrings radiate sparkle at every turn. Fashioned in 14K white gold, each earring features a round diamond center stone surrounded by a shimmering frame of smaller round accent diamonds. 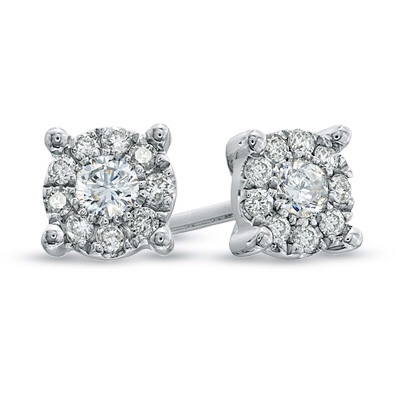 Designed to delight, these earrings captivate with 1/4 ct. t.w. of diamonds and polished shine. The post earrings secure comfortably with friction backs. 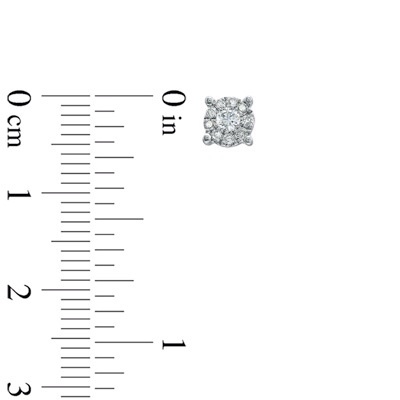 PRODUCT SPECIFICATIONS Stone Type	Diamond Stone Shape	Round Diamond Total Weight (CT. T.W.) 1/4 Diamond Color	I - J Diamond Clarity	I2 Stone Setting	Bezel Gold Karat	14K Back Type	Friction Lifetime Diamond Commitment	Yes Metal Color	White Metal Type	Gold Stone Color	White Diamond carat weights (CT.) represent the approximate total weight (T.W.) of all diamonds in each setting and may vary no more than .07 below the stated weight. Typographic errors are subject to correction. Merchandise enlarged to show detail and may not always be exactly as pictured. Promotions, prices, styles and availability may vary by store and online.